BURLINGTON, MA—In the entire selection process for the Woman of the Year every year, judges have the toughest job of choosing the Woman of the Year of a talented pool of 20 outstanding women, and they always choose the best. This year, they went beyond that and even created a special category of “Honorable Mention” that included two impressive women. Judges, whose names are not disclosed until the Woman of the Year winner is announced, are the key part of the Woman of the Year selection process. Like in the past, the independent panel of judges this year consisted of seven respected individuals from the community, representing various fields. Raj Sharma, Managing Director – Wealth Management and Head of The Sharma Group Merrill Lynch Private Banking and Investment Group, served as the chair and chief judge of the independent judging committee for Woman of the Year 2018. Other members were: Manisha Bhatt, Senior Attorney, Greater Boston Legal Services; Asha Dixit, CEO, Shah, Dixit & Associates P.C. ; Sanjay Kaul, Civil Engineer, Massachusetts Department of Transportation, Kashmiri Overseas Association and World Hindu Council of America; Annette Philip, Vocalist and Faculty Member, Berklee College of Music; Mitali Prasad, Portfolio Manager and Senior Equity Analyst, Trillium Asset Management; and Satish Tadikonda, Entrepreneur-in-Residence, Rock Center for Entrepreneurship at Harvard Business School. Ms. Bhatt is Woman of the Year 2017. She is a senior attorney with Greater Boston Legal Services where she practices family law concentrating in domestic violence law. Currently, she works with area hospitals’ domestic violence programs to facilitate their patients’ access to civil legal services and staffs a legal clinic at Rosie’s Place, a refuge for homeless women in Boston. Ms. Bhatt also serves on the advisory board of Saheli, a South Asian domestic violence prevention organization. She is a past president of the South Asian Bar Association of Greater Boston. In 2013, Massachusetts Governor Deval Patrick appointed Ms. Bhatt to the Massachusetts Judicial Nominating Commission. In 2009, she received the NASABA Cornerstone Award for her work with domestic violence survivors. In 2010, she founded the Know Your Rights! Program of the South Asian Bar Association of Greater Boston and has been the chief architect and director of the program since its inception. Know Your Rights! is designed to empower the South Asian community with knowledge about fundamental legal rights and providing connections to lawyers and other legal resources so that community members can actually exercise their legal rights. Ms. Dixit is Chief Executive Officer of Burlington, MA-based Shah, Dixit & Associates P.C., a full-service accounting firm focused on tax, accounting and consulting services to small and medium-sized businesses, professionals, and tax-exempt organizations in the New England area. Shah, Dixit & Associates was founded by the late Chandrakant Shah in 1991. Ms. Dixit joined the firm as a junior associate in 1993 and worked with Shah for five years before moving to a national accounting firm in Boston. She returned to Shah, Dixit & Associates in 2004 as a partner. Dixit has over 22 years of experience in public accounting, serving clients in manufacturing, biotech, hi-tech, construction, health services, real estate, retail, food and hospitality, non-profits, and professional service firms. In addition, Dixit advises corporations and individuals on issues related to international taxation, new ventures, acquisitions, and growth strategies. Dixit also frequently represents clients during Internal Revenue Service and state government audits. She holds an MBA and MS in Computer Information Systems from the Southern New Hampshire University and B.Com. (Honors) from Osmania University in India. Mr. Kaul is a certified Professional Engineer, presently working for the Department of Transportation where he has been involved in applying sound engineering techniques to enhance the quality of transportation planning within the State utilizing a multi-modal approach to manage and maximize the potential of Boston’s existing transportation systems and to identify next generation of transportation projects. Mr. Kaul is a life member of World Hindu Council of America (a US based non-profit organization) and is currently serving as a member of its Governing Council and is Vice President of Sampark-Networking, primarily focusing on chapter building efforts and promoting membership. Current focus is the planning and organization of World Hindu Congress in Chicago from September 7-9. Mr. Kaul is actively involved in planning and organizing Hindu Heritage Day in greater Boston area, a social and cultural event that promotes cultural diversity and heritage of the people from Indian subcontinent. Mr. Kaul is also a life member of Kashmiri Overseas Association (a US based non-profit organization) and has served as its president for two terms. Mr. Kaul was an organizing partner of the Third International Conference on Kashmir held at New Delhi in 2004. As a Coordinator for Kashmir Task Force within VHPA, his responsibilities include coordinating and arranging presentations, seminars and symposiums on Kashmir. Mr. Kaul has made presentations to Indian leaders, Government of India (GOI) representatives, and international leaders, representing the views and aspirations of Kashmiri Hindus. As a representative from USA, Mr. Kaul has attended Global Human Rights Defense (GHRD) Annual Congress at its headquarters -The Hague, Netherlands, held in September 2005. Mr. Kaul was a special invitee from the USA at the World Hindu Conference #3 at Prayag, Allahabad in 2007. 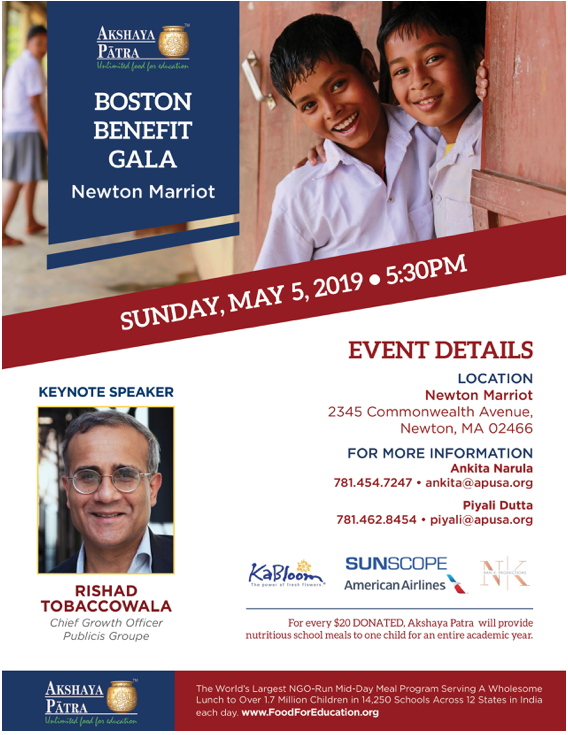 For charity works, Mr. Kaul was actively involved in supporting and promoting EKAL in Boston area during its infancy years and continues to do so. Currently, Mr. Kaul is actively involved in promoting “Support-A-Child” a program that provides, food, shelter and education to orphans and children from below poverty line families in India. Ms. Philip, an Indian vocalist, composer and faculty member at Boston’s esteemed Berklee College of Music, is the 2016 Woman of the Year. In 2003, Ms. Philip founded Artistes Unlimited in New Delhi, one of India’s largest and most diverse performing arts collective. Now based in Boston, she is the Founder-Director of Berklee’s immensely popular Indian Ensemble which has garnered over 76 million views, featuring musicians from 49 countries. In 2015, she was appointed as Artistic Director of Berklee India Exchange. Ms. Philip is also Creative Director and core vocalist of the award-winning international a cappella quartet, Women of the World, who were the 2014 USA National Acapella Champions and 2017 International Acappella Champions. Singing in over 30 languages, their recent CD titled “LIVE” was deemed eligible for Grammy nomination. Ms. Philip has performed with Grammy winning artists such as A.R. Rahman, Bill Whelan, Terri Lynn Carrington, Angelique Kidjo, Philip Bailey, Buster Williams, Jack DeJohnette, Ranjit Barot, Dr. Ysaye Barnwell, and Lew Soloff, besides prolific musicians – Airto Moreira, Nona Hendryx, and Pandit Anindo Chatterjee, to name a few. She serves as a judge on the popular American TV choral contest, WGBH’s “Sing That Thing!” and has won many awards in India and the United States for her work as a musical impresario and thought leader. Ms. Prasad is a member of the Investment Management Committee, a Portfolio Manager and a Senior Equity Analyst and has over 23 years of experience in the Investment industry. Prior to joining Trillium in 2016, she was a Portfolio Manager and Equity Analyst at Washington Capital Management where she covered multiple industry sectors as well as managed MID and SMID GARP portfolios. Before joining Washington Capital Management, Ms. Prasad was a Portfolio Manager at OFI Institutional Asset Management, a subsidiary of Oppenheimer Funds/Mass Mutual. She started her career in 1994 at Babson Capital Management where she was an Equity Analyst/Portfolio Manager on their small and mid cap portfolios. She is a Chartered Financial Analyst (CFA) charterholder and a member of the CFA Institute and the CFA Society Boston, serving on its SRI (Socially Responsible Investing) committee from 2008 – 2010 and as Chair of its Value Investing committee from 2009-2013. She also serves on the Board of Trustees at the Belmont Hill School and is an advisor to the Winchester Community Music School after having served as its Treasurer and Investment Committee Chair. She is also a frequent speaker on topics related to Impact and ESG (Environmental, Social, Governance) Investing. Ms. Prasad holds a Bachelor of Electronics and Telecommunications Engineering from the Delhi Institute of Technology in New Delhi, an M.B.A. from the Indian Institute of Management in Bangalore, and a Master of International Affairs from Columbia University in New York where she received a GE Fellowship. Mr. Sharma is managing director – Wealth Management and Head of The Sharma Group, a high-end boutique within Merrill Lynch’s Private Banking and Investment Group and has over three decades of experience in customized investment and wealth management for entrepreneurs, corporate executives, families and institutions. For 15 consecutive years, Mr. Sharma has been recognized by Barron’s Magazine as one of America’s Top 100 Financial Advisors. In addition, Barron’s recognized Raj in their “All Stars” list – one of fifteen advisors who have appeared in Barron’s ranking of America’s Top 100 Advisors for fifteen consecutive years. When Mr. Sharma is not advising his clients, he spends his time with various charities. He is an active member of the community and is involved in many local and global organizations. He is a current trustee and former Chairman of The Boston Harbor Island Alliance. He is a member of the Board of Trustees for Emerson College and a trustee and board member of the American India Foundation (AIF), an organization devoted to accelerating social and economic change in India. In addition, Mr. Sharma is Chairman of the Board of Youth LEAD, an internationally recognized organization promoting cultural understanding and tolerance among high school students. Mr. Tadikonda is an entrepreneur in the life sciences and healthcare sectors. His current venture, Avigo, focuses on using healthcare information to optimize clinical trials. In addition to his current venture, Satish is also an Entrepreneur-in-Residence at the Rock Center for Entrepreneurship at Harvard Business School, and also serves as an Executive Partner of Blue Cloud Ventures. As a member of TiE Angels, Satish is an active early stage investor. He helped co-found TiE ScaleUp and is deeply involved in working with many startups. Satish is a member of the Board of Directors of Wyebot, Medumo, Anju Software, and Gateway for Cancer Research.